Kenya Embroiderer’s Guild held its 9th Annual General Meeting today the 12th of May 2016. At the AGM Chairman’s Gail Langton annual report was read and the financial report was presented. The yearly embroidery exhibition by KEG is coming up in October 2016. Once again we are looking forward to some exclusive pieces of work done by our members. We are looking for Sponsors, if interested do get in touch with us. 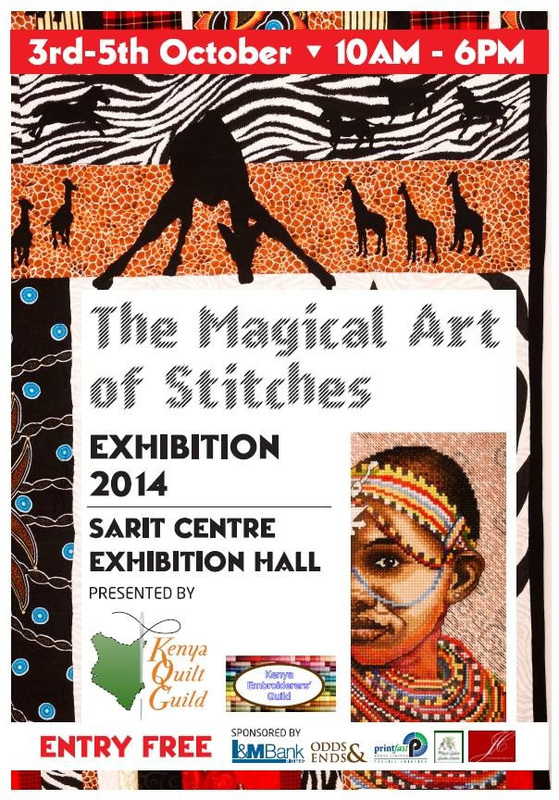 The money raised helps us to conduct yearly masterclasses in embroidery by some renowned embroiders . Membership is due for renewal, at 1500/- for the year. The Guild Challenge. The idea is to sew an embroidery with the theme “The Sea” or “The seashore”. This gives a lot of lee way in so far as you could stitch a landscape, fish, boats etc. In the kit is a larger piece of material. This is to be used as the base for your embroidery. Should you not like the colour fee free to use another fine material on top e.g. china silk. Also supplied are a few smaller pieces which can be used as part of the design. 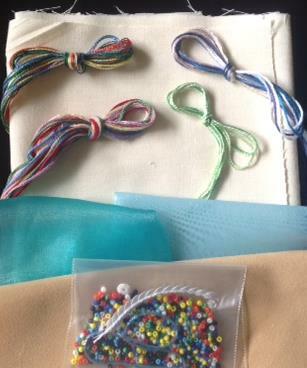 A small selection of threads and beads are also provided. You may (and in fact are actively encouraged to!) add to the items supplied. 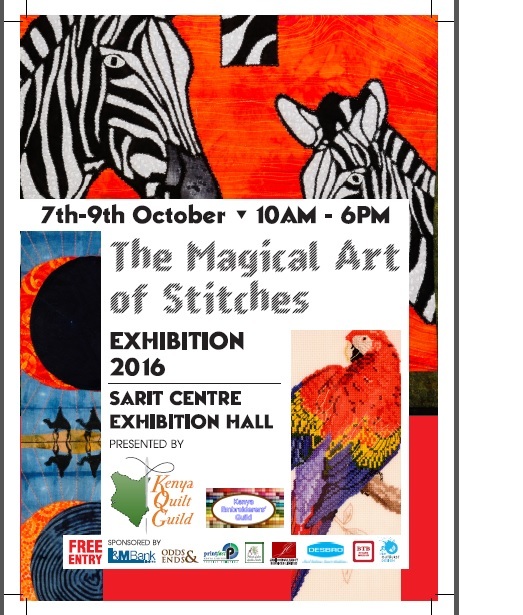 The date to hand your piece in is now January 14th 2016 – so start stitching!!! After the AGM, the workshop will be held on technique chicken scratching and the kit makes a kitchen appliance cover. Why should you be a member of the Guild? You get discounts on entry to the meetings, discounts on the price of the kits, discounts and priority booking for the masterclasses, discounts at certain Nairobi shops (now including The Woman Shop (make sure you have your membership card with you), Uniq framers, Freemans) and the wonderful KEG newsletter. Please bring small change if you can, it helps with entrance, kits and raffle! Pulled thread embroidery is a form of counted thread embroidery. Also known as drawn fabric, is a form of whitework that does not involve cutting the fabric threads. The lacy effect is created by applying tension to the stitching thread and pulling the thread tight. The more tension applied, the wider the open area becomes. Earlier samplers in the 17th and 18th centuries contained pulled work. The technique was made popular by peasant women imitating the fine, and expensive, laces. Drawn thread embroidery, however, is where fabric threads are cut and withdrawn, leaving a hole. 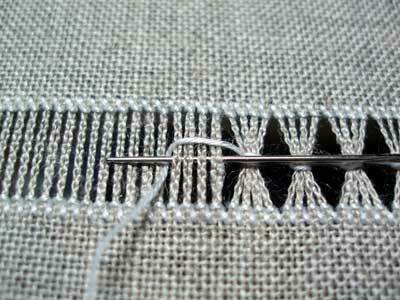 Unlike normal needlework, in pulled work the stitches themselves are not always meant to be seen. Instead the holes or perforations caused by the movement of the fabric threads create the pattern. For this reason the best results are obtained by using the same coloured threads and fabric. Another benefit of using the same colour thread is that any traveling stitches, taken to keep the pull on a stitch when moving to a different row, are not visible. Embroidery looks great all by itself, but sometimes you want a little extra something. 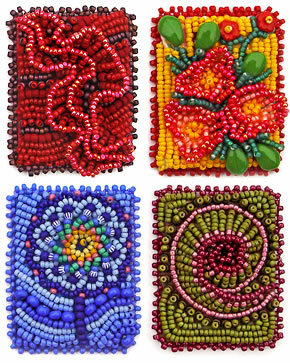 Using beads is a great way to add texture and sparkle. The embroidery gets little more expressive. There are three basic methods that can be used to embroider with beads: individual beads may be sewn directly onto fabric, or several beads may be run through a needle before running through the backing, or else a line of threaded beads may be laid upon a fabric and secured with couching stitches. -Always insert your needle straight, inserting a needle at an angle makes beads spaced too far apart or will bunch in together making little bulges in your rows. -When you string next set of beads, then push them down to where your earlier thread exists. – If row of bead embroidery looks a little wobbly, try running your thread through the beads once or twice after you finish each row of bead embroidery. The extra thread will help fill up those bead holes and make them line up straight.